Cleveland Public Power staff members don their red in support of Go Red For Women! “GO RED FOR WOMEN”… what’s that all about you ask? Well let me tell you! It is a campaign designed by the American Heart Association over ten years ago to promote heart health and highlight the importance of focusing attention on heart disease because it is currently the number one killer of women in the U.S.
Around this same time the American Heart Association realized that heart disease was not just taking the lives of more women than men, but it also took more women’s lives than all forms of cancer combined… now how crazy is that! As an organization, why not get involved? Here at Cleveland Public Power, we not only care about our external customers… we’re also concerned with the health of our employees (our internal customers). We value our employees and we want to encourage them to live a healthy lifestyle. So for a number of years we CPP has participated in the annual national “Go Red for Women” campaign which consists of wearing red on the first Friday in February in support of heart health month. 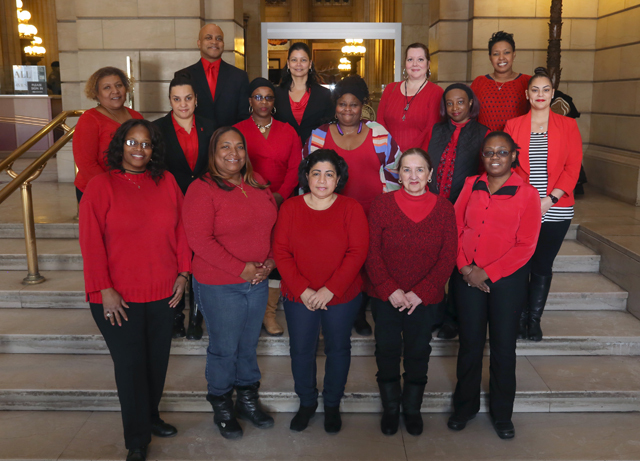 In addition to wearing red, we also take a group photo in the Rotunda at Cleveland City Hall, and individual photos at our Administration Building with those donning their red in support of this cause. With the individual photos, we ask employees to tell us why heart health is important to them, and they will be featured on CPP’s Facebook page. Here is a response from one of our employees. “The fact that I’m getting older made me realize how important my health (heart) is to me. Now I have a daily routine which consists of a total of a 20-30 minute walk in the winter (which increases to 45-60 minutes in the summer). As well as eat plenty of fruits daily,” says Customer Service Representative Precious Robinson.